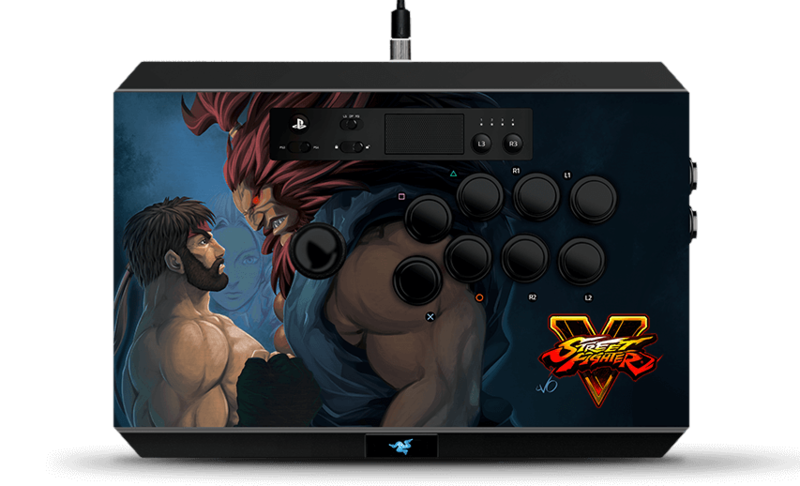 Esports at Capcom USA, Inc.
You've worked with the Street Fighter licensed products for quite some time now, what made you want to work with Razer for the Capcom Pro Tour and this Street Fighter V themed arcade stick? John Diamonon (JD): There were 2 things that really impressed me about Razer. The overall craftsmanship of their Panthera stick is top notch, and there was never any doubt about that. Its's the best quality stick at an affordable price point. But really, what drew me to Razer was the people. They've shown a true commitment to the FGC, from how they treat their sponsored players to their consistent involvement with supporting and advocating the community we all love. They are committed to CPT and the FGC for the long run and we're committed to them as well. It's always awesome to make great things happen with real friends and not just business associates. 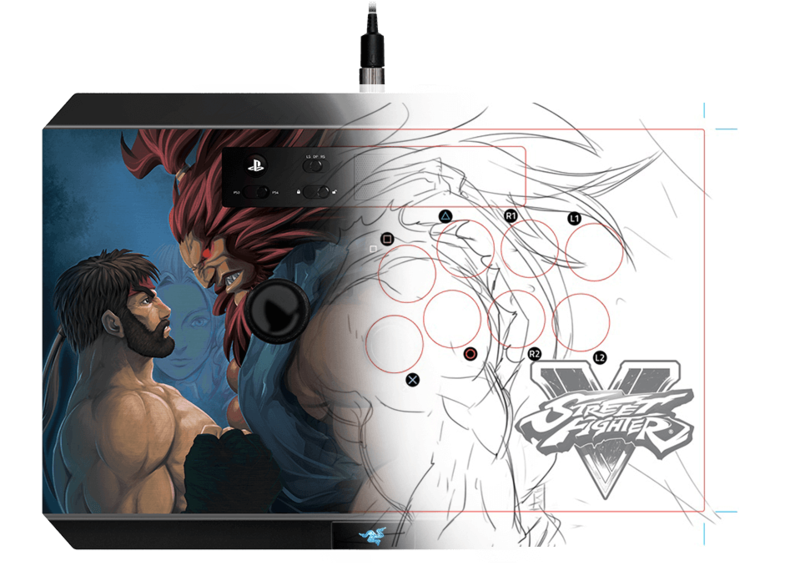 Can you explain the concept behind the artwork used in this limited edition Street Fighter V Razer Panthera Arcade Stick? Long Vo (LV): This piece is a homage to the classic Street Fighter Alpha cover image featuring Ryu and Akuma staring each other down. This piece was originally drawn by Daichan for Street Fighter Alpha 2 and is one of the iconically recognizable pieces of that era. This piece is my take on the same image using the updated designs from Street Fighter V. I hope I did it justice! 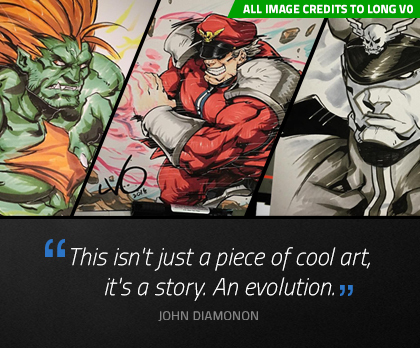 How do you feel about this fresh new take on one of the most iconic Street Fighter scenes of all time? JD: When I saw the initial concepts that Long brought to the table, I was blown away. I've worked with Long for so many years and love how collaborative his process is. This isn't just a piece of cool art, it's a story. An evolution. When you see the original Daichan piece, what's genius about it is Ryu's emotion in it. He's facing his "demon" at such a young age. You can see the anger but also the fear in his eyes. Look how Daichan portrayed Ryu's posture and eyes in the original piece. I look at it and I'm scared for him. Fast forward to this new piece from Long. Both Ryu and Akuma have changed significantly since their last encounter from SFA2. Akuma has embraced and is consumed by the Satsui No Hado so much so that he looks almost lion-like. A true killer. A king of this dark discipline. Ryu is no longer this young boy facing his fears for the first time. He's now grizzled and war-torn. Hell, look at that nicely manscaped beard. (No wonder Hot Ryu is now an official name. Thank you Twitter!). He's much more prepared and ready for battle, but still not all that confident. I love the piece so much and loved collaborating with Long and MarkMan on this important piece. Anything you want to say to Street Fighter fans? Anything new we can look forward to from you guys? 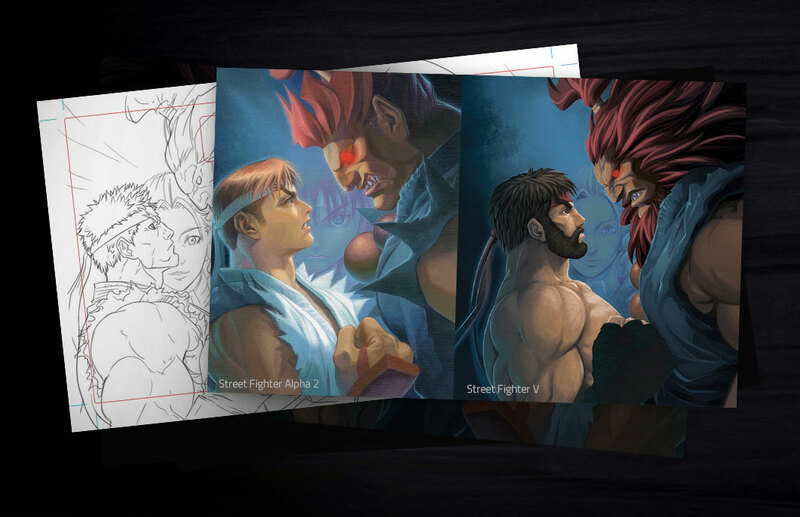 LV: This year is Street Fighter's 30th anniversary and I'm both honored and excited to be working with Capcom, UDON Collectibles and Nsurgo to make some really unique and awesome Street Fighter merchandise to honor the legacy of this awesome game that I've been fortunate enough to be associated with over the past 18 years. Please look forward to some of our Comic Con exclusives including all things Street Fighter-- from skatedecks to limited edition collectible Metal Cards, collector's pins, snapbacks, Tshirts, comics and more! JD: If there's a way to pre-order this stick, please do (Editor’s note: it will be available in July 2017!). We don't want to leave anyone behind. There's only so much we can produce to meet demand. And look out for more cool collabs between Capcom and Razer in the rear future. We just want to make cool shi...stuff.